Food safety refers to the conditions and practices that preserve the quality of food to prevent any food related illnesses or contamination. All actions and inactions, from production to consumption play a significant role in the hygiene and safety of the food we are eating. The main challenges that are encountered when dealing with food is, determining whether foods are cooked to the required temperatures, how are foods best stored and at what temperature should they be stored to eliminate any chance of an illness. Having a food-borne illness claim can have irreparable consequences to a business; by simply following the HACCP guidelines, this will ensure your company is compliant with the law regarding food safety and will also increase the food quality standards and the food safety standards within your business. If you’re looking for a cost-effective way to minimise risk within your company and increase efficiency among employees, then FoodSafe might just be what your company needs. By having FoodSafe incorporated into your business it can minimise the chance of any food-borne illness claims by providing strong evidence of the actions and measures taken by your employees to ensure food safety was applied during all tasks. FoodSafe has been created based on HACCP Guidelines for food safety and hygiene practices, to provide accurate and real-time systematic monitoring and reports for all food outlets, including retail and manufacturing. The app is designed to record temperatures of all foods cooked and all foods stored. 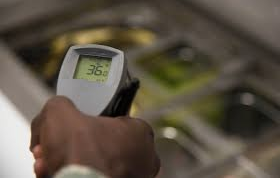 Employees can only continue if it is within the HACCP Guidelines and therefore if the temperature recorded fails the regulations, follow up actions can be created to record due diligence. What is HACCP and what does it stand for?